Wall Lamp Adaptor. Allows fixing of wall lamps to horizontal or vertical tape runs. 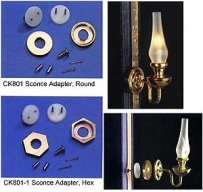 Round and Hex adaptors available to suit any wall lamp.